Prime Minister Moses Nagamootoo (left) and former House Speaker, Senior Counsel Ralph Ramkarran. Prime Minister Moses Nagamootoo on Monday said he would not be ceding responsibility for constitutional reform to anyone else if the opposition People’s Progressive Party (PPP) refuses to meet with him to discuss the process. The PPP had in the past expressed reluctance to take Nagamootoo’s offer of a national unity government. He is a former executive of that party who resigned and later went on to join the Alliance For Change (AFC), sponsored a no-confidence motion against the PPP-Civic administration and became Prime Minister after that party lost the 2015 elections. Nagamootoo urged the PPP to prioritise its interest in determining whether personality is bigger than Guyana. After the Prime Minister stated that “nation comes first before Nagamootoo,” and he vowed that “I would carry the mandate that I have been elected to do” if the PPP refuses to meet with him, he was asked why shouldn’t he step aside if he is regarded as the stumbling block. “I cannot give up my responsibility on the foibles of a political dream. (Opposition Leader Bharrat) Jagdeo cannot determine who is in charge of constitutional reform. He sits on a cloud and he wants ti run the government. Come on!,” he told Demerara Waves Online News. Certain entrenched constitutional provisions would require at least two-thirds support from among the 65 members of the National Assembly which means that the PPP, which holds 32 seats, would have to agree to such changes. “The bill would then set up the constitutional reform commission to conduct the hearings and unless I have that out of the way, then no hearings will begin,” he said. Nagamootoo hopes that “some work” on the process to be advanced before parliament goes into its annual two-month recess. The Prime Minister was Monday expected to begin reviewing a draft report by a United Nations Development (UNDP) scoping mission that was recently here to explore ways of providing technical and financial assistance. 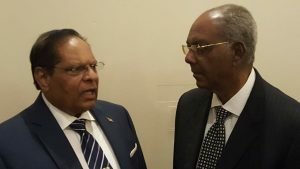 The veteran Guyanese politician said “I am expecting a rough ride ahead” but he is committed to compromise and consensus on the bill with the PPP to achieve constitutional reform. He said whenever he sends material to the PPP, they are obliged to give them serious consideration. “They have to treat these things on their merit and not treat the person who sends it. That’s not the issue. Constitutional reform is the issue and Jagdeo has said he is committed to constitutional reform so he has to decide whether the issue is constitutional reform or the issue is Nagamootoo, whether Nagamootoo is bigger than the nation and I’d like him to tell the country and the supporters that ‘yes, Nagamootoo is bigger than the nation’ and I respect the man for that,” he said. Former House Speaker, Ralph Ramkarran last weekend told a public symposium on constitutional reform organised by the Carter Centre and the British High Commission that the government and the opposition would have to hold talks on further reforming the 1980 constitution, despite reservations about Nagamootoo. ““I don’t know how the dilemma of having Moses, as Prime Minister, speaking to the Opposition- I don’t know how that will be resolved but I hope it is because they are reluctant to speak with him,” he said. Ramkarran has recommended that the constitutional reform process need not be large scale, but instead focus on a number of areas promised in the governing coalition’s 2015 general election manifesto. They are that the Prime Minister would be drawn from the party with the second highest number of votes and any party that wins 15 percent or more of the votes will be included in the government.